Fringing the Australian coastline is 50,000 sq km of living reefs – just under one fifth of the world’s total reef area. These densely populated habitats of tropical waters house about 25% of all ocean species. Despite their vital role in a healthy ocean, 10% of the world’s reefs have already been ecologically destroyed. It is estimated that half of the world’s reefs will collapse by 2020. The bounty and beauty of these living structures and the fragility of their future was the impetus for this exhibition. 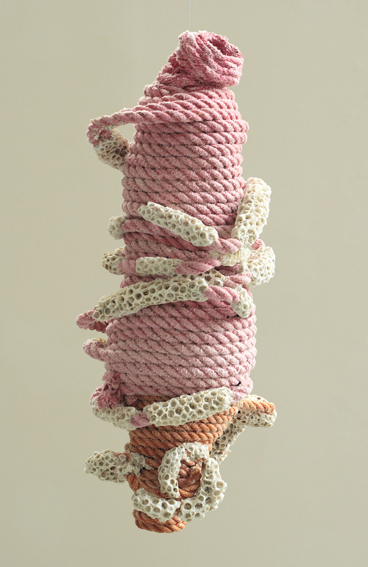 In Coral: art four artists exhibit works that explore our relationships with this fragile waterscape. In Coral: science the work of four University scientists demonstrates the importance of research for understanding the reefs and their future. In Coral: life two schools in the Torres Strait share their vision of living on the reefs of the Coral Sea. This exhibition features some of my 3d pieces, including new work commissioned for this project. Thanks again for working with us for coral: art science life, it would not have been as successful a show without your beautiful and intellegent work.